Pet hedgehogs thrive best on a diet high in proteins, low in fats and rich in chitin. Unlike their wild relatives, pygmy hedgehogs to not hibernate and do not expand a lot of energy. They are greedy eaters and prone to obesity, so owners need to mindfully regulate feedings. 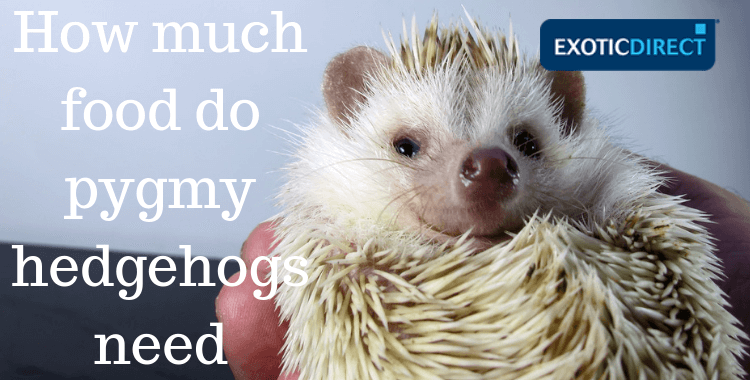 Is your Pygmy hedgehog insured? 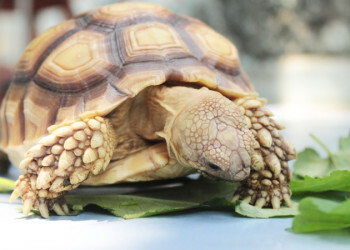 Get a quote for £2,000 of vet fee cover, death and theft cover | We've been insuring exotic pets since 1996 | Check out our customer reviews on Feefo. The African Pygmy hedgehog is the most popular species of hedgehogs kept as pets. We use pet and pygmy hedgehog in this piece interchangeably. What do hedgehogs eat in the wild? | What can pet pygmy hedgehogs eat? | What kind of cat food can hedgehogs eat? | What insects can pygmy hedgehogs eat? | What kind of meat can hedgehogs eat? | What can hedgehogs not eat? | Where can you buy hedgehog food? What do hedgehogs eat in the wild? This is similar to what you’d feed an African pygmy hedgehog, but it differs in terms of how much as African Pygmy Hedgehogs do not expand a lot of energy. In the wild, hedgehogs have to forage for food. As a domesticated species, African Pygmy Hedgehogs don't have to. They are greedy eaters and are predisposed to obesity, so, many of the insects that make up the majority of a wild hedgehog's diet should only be given as treats to pet hedgehogs. African pygmy hedgehogs are a domestic breed and naturally need less fat in their diet as they expand less energy and unlike wild hedgehogs they don't hibernate. 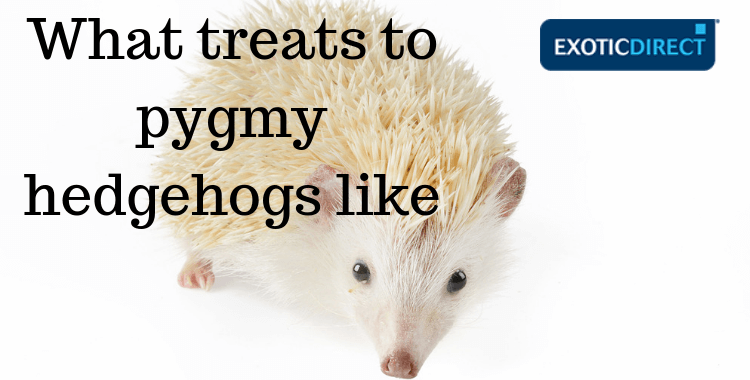 What can pet pygmy hedgehogs eat? Their staple diet should be composed of high-quality poultry-based cat food with a ratio of proteins to fats as close to 34% to 15% as possible. Pet pygmy hedgehogs should digest between 28% to 35% proteins and 12% to 15% fats. A protein-based diet with a low-fat intake does not mean no fat. Maintain the necessary amount of fat in your hedgies diet – between 12% to 15%. Pet hedgehogs are prone to obesity as they are not as active as wild hedgehogs who have to hunt their food, so insects, fruit and veg should only be given as treats.Obese hedgies are not very fond of exercise. Weight gain can cause diabetes and liver issues. Owners need to monitor their hedghie's weight carefully and regulate their food accordingly. What kind of cat food can pygmy hedgehogs eat? Favourite brands among African pygmy hedgehog owners are Purina One and Iams. High quality, poultry-based cat biscuits seem to be the number one choice among hedgehog owners. Poultry-based dry cat food high in protein and low in fat needs to make up the majority of a hog’s diet. Moist cat food, insects, fruit & veg, boiled eggs and baby food are used to supplement a pet hedgehog’s diet. What insects can pygmy hedgehogs eat? Mealworms and crickets are among their favourites. 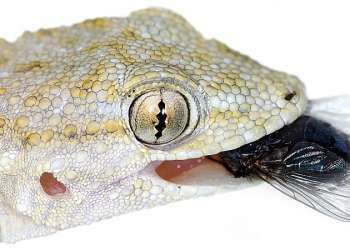 They can also eat beetles, waxworms, millipedes, grasshoppers, hornworms and maggots. You have three options when feeding pygmy hedgehogs insects: live insects, freeze-dried insects and canned insects. Insects are important for hedgies as their exoskeletons are a source of chitin – a type of polysaccharide good for hogs. Never give your hedgie insects you caught yourself or bought from a bait-shop as they might carry bacteria, toxins and parasites. You can purchase live insects from Northampton Reptile Centre. Insects are hedgies’ junk food, so to speak. So, they are good as treats but shouldn’t make most of their diet and shouldn’t compromise their staple diet. They are selective eaters and are likely to, in a mixture of insects and staple diet, pick out the highest in calories food which would quickly cause weight gain. So, insects and other high calorie treats need to be given with caution. What fruit can pygmy hedgehogs eat? Never give your hedgehog grapes or raisins as they are reported to be toxic to them. Some fruits, such as bananas and apples, contain a lot of sugar so are best given as rarely as possible as sugar can cause weight gain and even diabetes. What vegetables can pygmy hedgehogs eat? Don’t feed your pet hedgehog starchy veg, such as corn, potatoes and celery. Hedgies don’t process vegetation so well. If you give them vegetables, make sure they’re diced. Cook harder vegetables, such as carrots, to make them softer. Peas and corn should be given in very small amounts as they can unbalance the Calcium/Phosphorus levels in hedgehogs’ metabolism. What kind of meat can hedgehogs eat? Cook without any oil or seasoning. Make sure that the pieces you give to your hedgehog are not too big for him or her to eat. Shred, mince or dice the meat into fine pieces. Dry food should be your pet hedgehog’s staple diet. High-quality dry cat food or specialist hedgehog food, poultry-based and with a 34% to 15% protein to fat ratio. Moist foods are primarily given as treats in the form of canned/moist cat food, boiled or scrambled egg or baby foods. Hedgehogs who are fed mainly canned cat food might need additional fibre in their diet. Moist foods are not as high in fibre as dry foods. Hedgehogs need approximately 15% of fibre in their diet – a lot compared to the percentage of fibre found in most foods and especially in moist foods. Remove any uneaten moist food after about four hours. Moist food shouldn’t make the majority of a pygmy hedgehog’s diet – If given only soft foods, hedgehogs’ teeth might start decaying. That said, if your hog has dental problems, it is best to stick to soft foods. Grapes and avocados are toxic to hedgehogs. While some people give crushed peanuts to their hedgies, nuts and raisins are generally considered a choking hazard as they get stuck on the roof of their mouth. Avoid giving your pet hedgehog insects you’ve caught yourself as they might have digested toxins. Monitor your hedgehog’s response to different foods and if you notice something unusual like diarrhoea or other signs of an upset tummy, discontinue the food and consult with your vet. If you’re not sure whether something’s good for your hedgehog don’t give it to him. 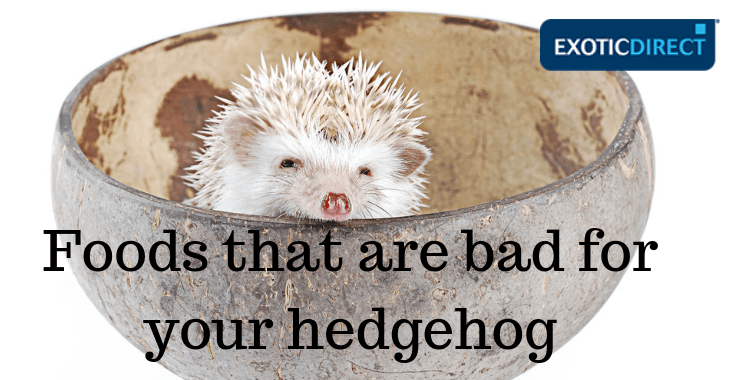 Fruit and Veg that are bad for your pygmy hedgehog. Dried fruits are a choking hazard. Starchy vegetables are nearly impossible for hogs to digest so avoid them. Can pygmy hedgehogs eat grapes? Hedgehogs cannot eat grapes and raisins as they are toxic to them. If your hedgie digests grapes by accident, seek immediate veterinary assistance. Can pet hedgehogs have milk? Hedgies are lactose intolerant; giving them milk can cause diarrhoea. Some say that yoghurt is fine because the lactose proteins in yoghurt are broken down differently. If you decide to test this theory, give a very small amount and monitor your hedgehog’s response to it. It is unclear whether fish is good or bad for hedgies but many experts, including the RSPCA, advice against it. It is worth noting that fish is not part of hedgehogs’ natural diet. Can I give my hedgehog dog food? High-quality, protein-based dog food with the right protein to fat ratio can be given to pet hedgehogs as long as the kibbles have been broken into more manageable pieces. It is not one hundred percent clear whether dog food is good for hedgehogs. One of the concerns expressed by hog owners is the size of the kibble – a lot larger than cat food kibbles. A second concern is the quality of dog food – many dog foods are corn-based and have more fat than recommended for hedgehogs. How varied should a pygmy hedgehog’s diet be? Pet hedgehogs need a varied diet. This can be achieved by supplementing their staple diet with nutritious treats. Hedgehog diet hasn’t been studied enough, but the vast variety of foods they eat in the wild leads experts and breeders to try to emulate that in order to maintain a broad nutritional content. Make sure to introduce one new type of food at a time. Monitor how your hedgie likes it and responds to it before introducing another type of food. That way, should your hedgie have an adverse reaction to anything you give it, you’d know what food caused it. What treats do hedgehogs like? Pygmy hedgehogs love insects, especially mealworms and crickets. Only give up to two insects a day. Introduce one new treat at a time so you can monitor your hedgehog's response to it. Give small amounts of treats every day – giving your hog too much, and too many might spoil its staple diet. Hiding treats in different places for your hedgehog to search for is an excellent way to encourage exercise. Treats are fun for hedgies and are also a source of nutrients complementing their staple diet. Never leave moist or fresh food to go off in your hedgehog’s enclosure as you don’t want him or her to digest gone off food. Treats might make your hedgehog’s poo a different colour or stinkier than usual. How many times a day should you feed a pet hedgehog? A lot of pet hedgehog owners recommend once to twice a day. Some say they prefer a free feeding schedule and keep their hedgie’s bowl full at all times. Bear in mind that this could lead to obesity however as hedgies are greedy eaters. Most pet hedgehog enthusiasts agree that baby hogs and pregnant or nursing hogs need an unlimited supply of food. If you do notice that your baby hog is putting on weight though, begin regulating its food intake and encourage exercise. 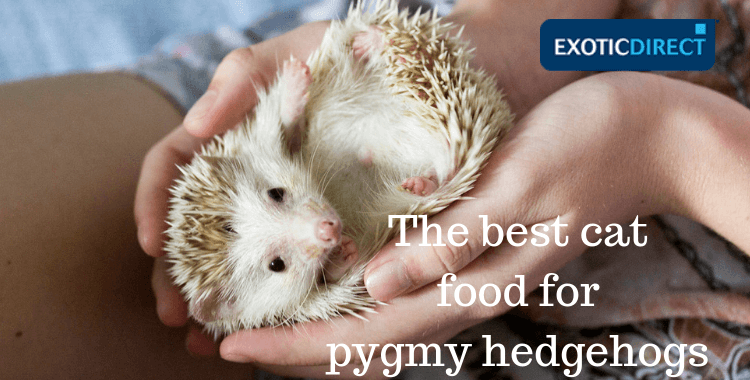 How much food a day does a pygmy hedgehog need? A lot of hedgehog owners recommend one tablespoon of food once to twice a day. Most prefer a free feeding schedule. Baby hedgehogs need to have constant access to food. Pregnant and nursing hogs are expected to eat more. The exact amount of food your hedgehog eats depends on the food you feed it, on how active the hog is and on its appetite. Monitor your hog and feed accordingly. When should you feed your hedgehog? A good time of the day to feed your pet hedgehog is around twilight as they are active during the night and that’s their wake-up time. If you think your hedgie is acting hungry in the morning, feel free to give it a little bit more. Monitor your hog’s weight and restrict his feedings if needed. Where can you buy pygmy hedgehog food? Many pet hedgehog owners comment on Amazon that their hedgies like different brands. So you might have to experiment until you find the food your hog will like the most. Not all specialist hedgehog foods are high quality or have good nutritional content. Many experts fear that certain brands repackage lower quality cat food for hedgehogs and sell it at a higher price. We found a lot of hedgehog foods that contained ingredients, such as nuts, that are not generally recommended by hedgehog owners and experts. This means you really have to pay attention to the list of ingredients before buying. Whether you go for cat food or specialist hedgehog food, always keep in mind the foods that hedgies can and cannot eat and the protein to fat ratio recommended. Monitor you hog’s response to new foods and be mindful of his or her individual needs. Don't forget, Exotic Direct can insure your pygmy hedgehog. 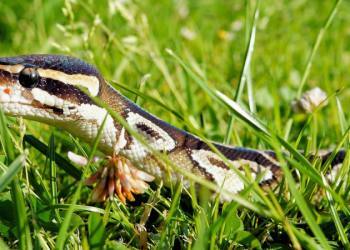 Fearless exotic pet owners give their pets unusual and exotic names!